This coming cool-weather season has a little bittersweet sense to it for me. In all likelihood, this is the last season I can dress the baby without her input. If she’s anything like her older sister, she’ll be nudging her own little self into the closet by the time her age approaches 2 and then my days of selecting her outfits are over. (You pick your battles, right?) So my hope is to buy her staples like leggings and solid-color bodysuits, then slip sweet little handmade items over them for me to enjoy while she’s still small and has amiable tastes. This dress was the kickoff of what I hope is a cluster of over-dress projects for this winter. 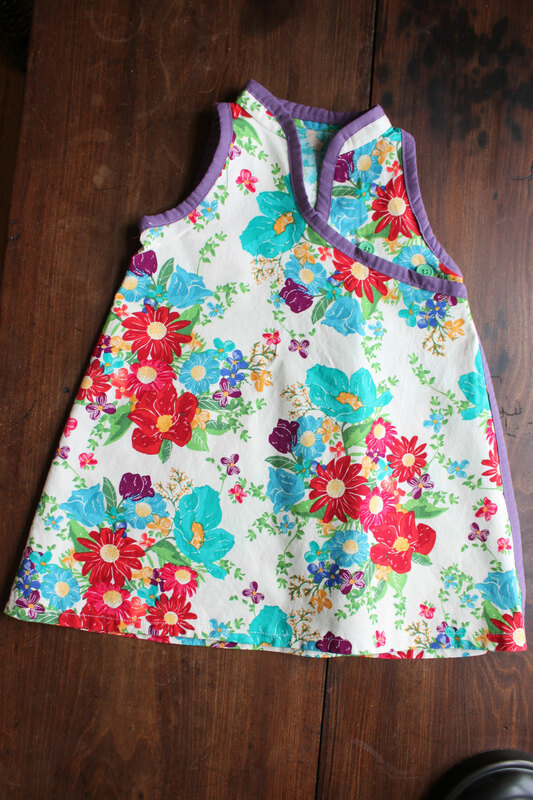 I used the Mandarin Dress pattern from the book Fabric-by-Fabric One Yard Wonders. I made a size 2 but cut an inch or so off the hem. I love the elastic loop and button closure on this pattern, but my little green buttons don’t show up all that well against this busy print. If I make again I’ll choose a tamer print and brighter buttons. It’s a sweet pattern so I’ll probably do just that. 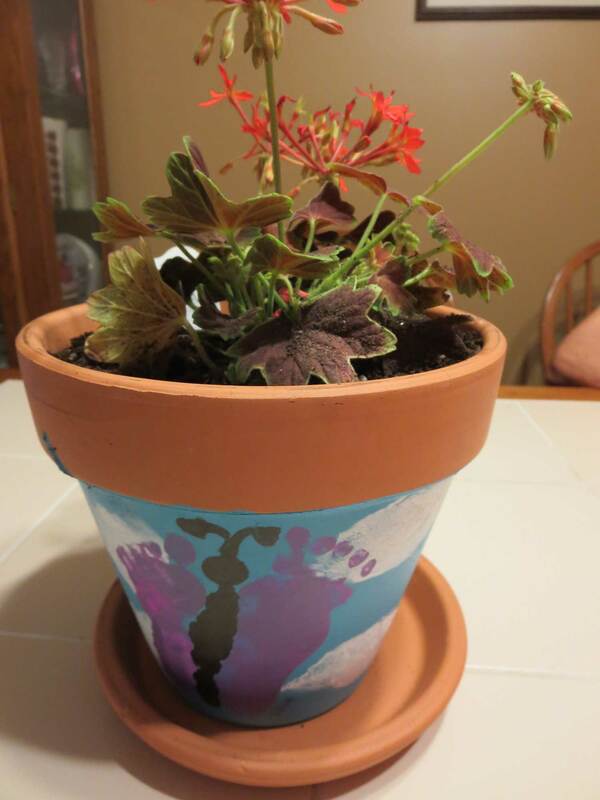 And here’s another project of my oldest daughter’s, because she loves it when I show off her goodies on my blog. 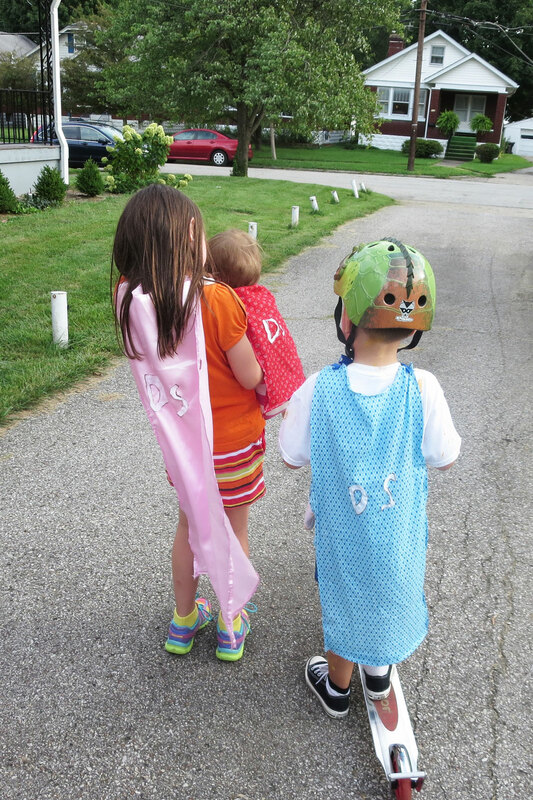 She made matching superhero capes for herself and her two siblings. She tells me the “DS” stands for “DeWees Superhero.” Love it! This room has appeared on my blog a few times in the almost four years since we moved here. There was the time I made the futon and pillow covers, and the time I painted the sun on the floor (now painted over, due to water damage). We don’t use this basement space as our primary homeschool spot anymore. It has evolved and changed, and I work on it periodically–sometimes because I want to and sometimes because it floods (or did? Supposedly that’s fixed now). This summer I made some more changes to it to continue to meet our studio and play space needs. It’s just a basement room with a low ceiling and a concrete floor; it’s never destined for Better Homes and Gardens or to be the room we spend the most time in, but it is good space. It’s a place to put the bulky things that aren’t in the kids’ rooms or our shared living space. 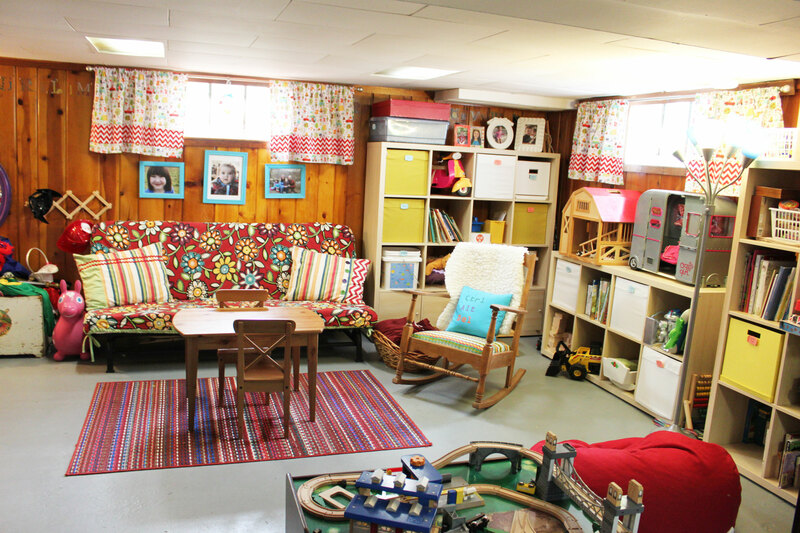 It’s the kids’ art spot, the dress-up spot, the home for games and toys. It’s the only spot in our home with a television. It’s the room where my fabric is stored, and is a cool place in summer and made cozy in winter with a fire in the fireplace. Some day it’s going to get a chair that doesn’t have an arm that falls off occasionally, a bigger and better rug, and I’m sure it will continue to evolve in other ways, but here are some scenes from this creative space right now. This summer I bought new storage furniture so the kids can easily access all the treasures. I set up a desk area dedicated to their crafty needs. 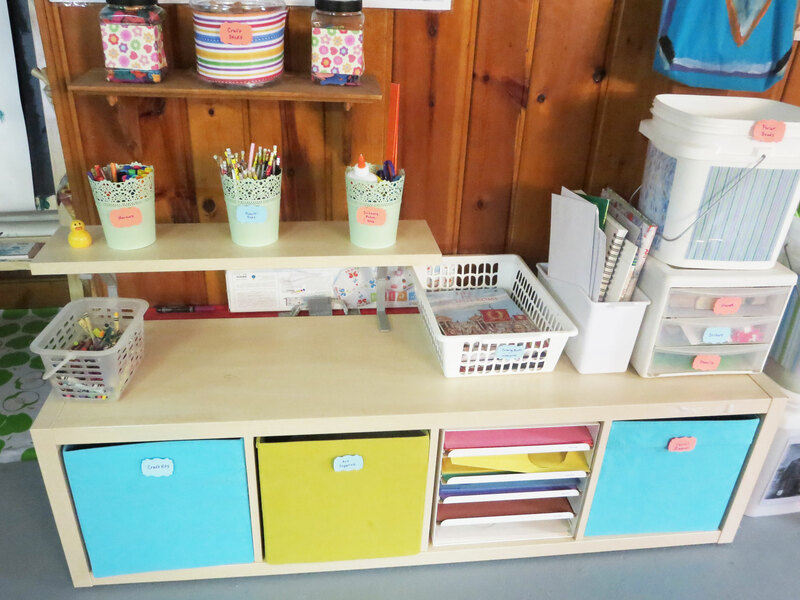 Colored paper, art books, clay, melt beads, yarn and assorted other supplies are organized and at the ready. The labels are serving the dual purpose of reminding my little artists to clean up after themselves and helping Worth learn to read. 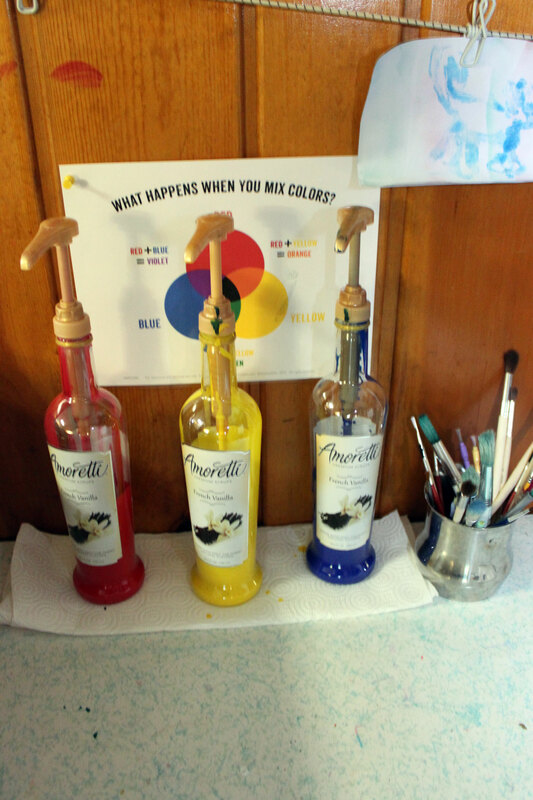 I saved coffee syrup bottles, washed them out, and filled them with tempera paints. 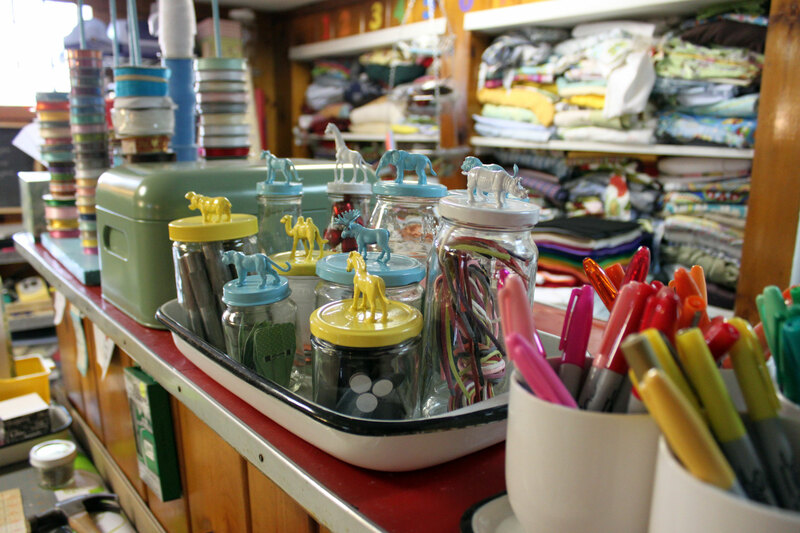 A color-mixing chart hung over the supply table helps the small artists mix their choice of hues. There is a bin under the table with clean, empty yogurt and applesauce containers we save. The older kids know how to wash the brushes out themselves so they are able to paint independently, without me dragging out supplies or cleaning up their messes. I hope to fill two more bottles with black and white paint, but first I have to drink more vanilla lattes. 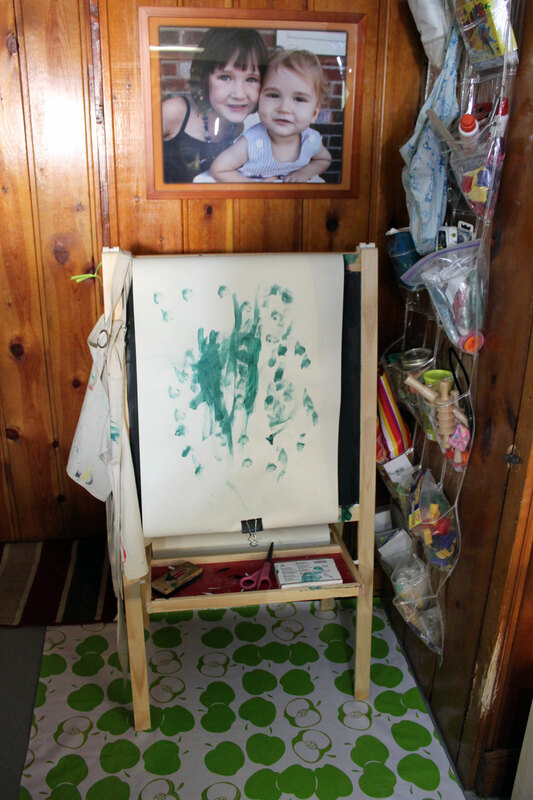 This is the easel, a half-turn from the paint-mixing spot. 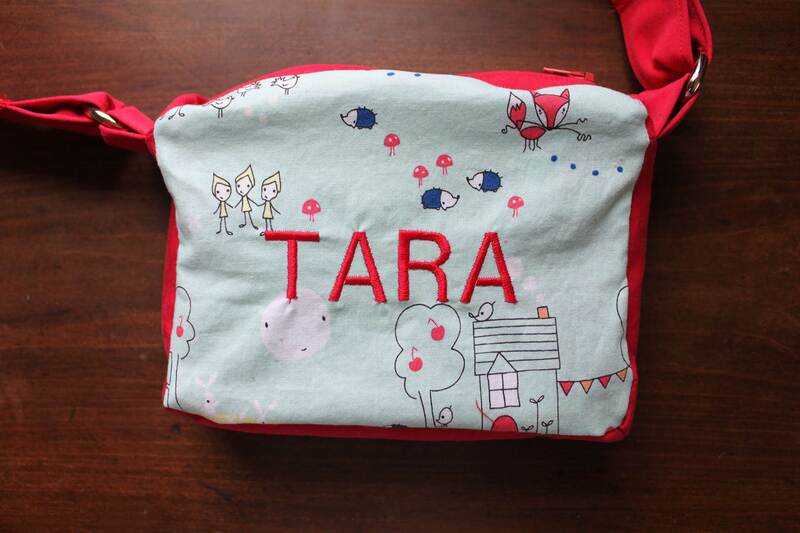 Bright oilcloth protects the floor, the canvas aprons protect the kids, and just out of the scope of the photo is a cord with clips for the kids to hang their masterpieces when they are done. My crafty storage area got a few upgrades too. I’m not very handy with tools but I knew just enough to drill holes in an old scrap board, insert some dowels, apply some paint, and enjoy my much-needed new ribbon organizer. 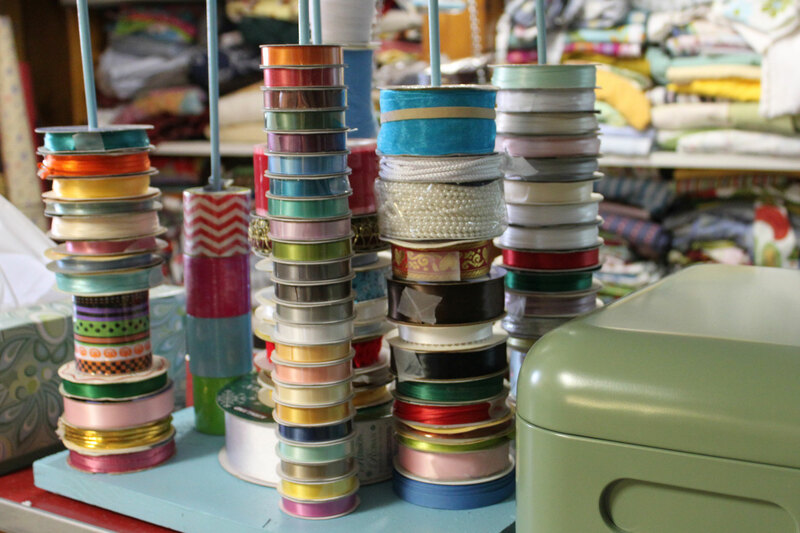 For several years I’ve been buying ribbon every time I see it on sale because I can never find it when I need it. Now I see clearly that the problem was my storage method–not my lack of ribbon! Cookies, a sweater…oh dear, I’m disorganized! It’s been almost a month since I’ve blogged. 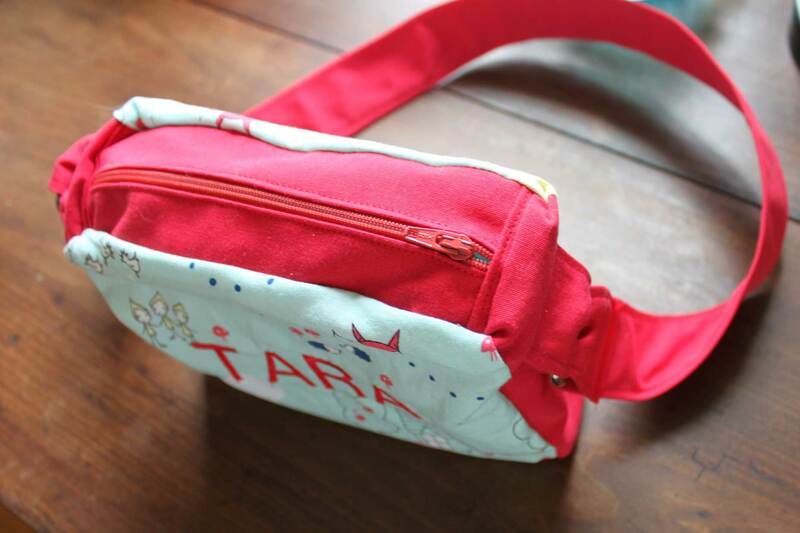 I’m sort of getting out of the habit of remembering to photograph projects when I finish them. I don’t think I’m ready to quit this blog thing yet because I enjoy keeping this little record for myself, but I do need to put a note or something on my crafty table so I don’t completely get out of the habit. In any case, here’s a little bit of what”s been going on at my house this past month. Dorothy and I made hair bows. I made a few for her (including this one I glued to a headband) and she made some for her cousins. We used a Bowdabra, which is simple and gives good results. It makes puffy bows–not the tidy little twisted kind you can make with templates. I’ve used the season as an excuse to try a bunch of gluten-free cookie recipes I’d been wondering about. I’m not gluten-free but my mother is, so I’ve been enjoying experimenting with gluten-free baking on her behalf. These sugar cookies were from Carol Fenster’s 100 Best Gluten-Free Recipes and they were terrific. I don’t think anyone would have noticed they were gluten-free if I hadn’t said something. I rolled them out between sheets of plastic wrap as suggested, but I found the dough just as easy to work with as regular cookie dough. These gluten-free jam cookies were from The Wheat-Free Cook by Jacqueline Mallorca. I don’t care for this book overall as well as the one above, but these cookies were tasty. They were really great just-baked and were nice but crumbly once they had been sandwiched with the jam. The drawback to them came the next day, when they’d apparently soaked up all the moisture from the jam and almost fell apart when I touched them, so they really want to be eaten only on the day they are made. Still, they are tasty and light with a nice flavor and don’t scream “gluten free alternative!” when you taste them. I finished knitting (knooking) myself this sweater a few weeks ago. Unfortunately the freakishly warm weather has prevented me from wearing it much. I ran into the difficulty once again of trying to get a decent photo of a project made for myself but this one will have to do. I’d like to show the neckline, which I particularly like, but I didn’t think to take off my scarf for the photo when I came in today from shopping. I used this Oatmeal Pullover pattern and the Lion Brand Wool-Ease yarn the pattern suggests, but in the color Eggplant. I like the sweater and it didn’t take that long to knook since the yarn is so chunky, but if this warm-weather trend continues I may never get to wear it since it is such a bulky, warm garment. I made the pattern in size medium, but since the knitter controls the length and the sleeve length I think I could have gone down a size and cut down on some of the bulk. Finally, this is what my kids made their instructors/nursery care providers/extracurricular teachers as holiday gifts this year. 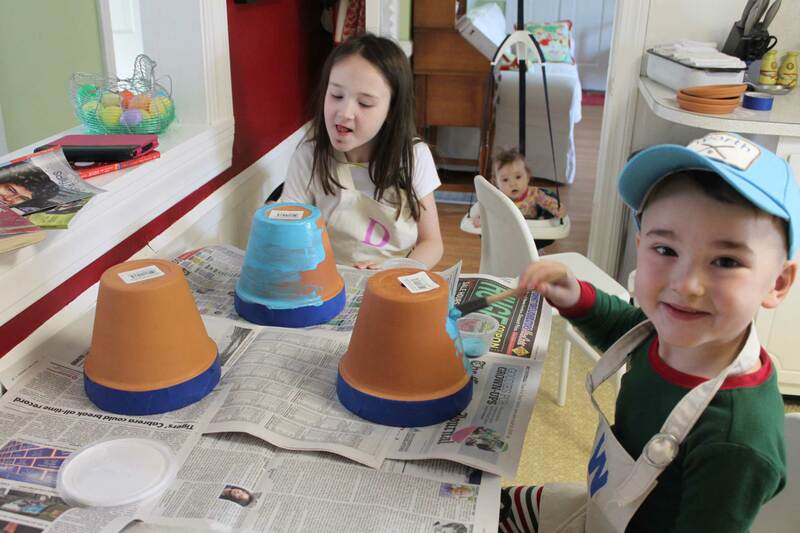 Last year we did jars of homemade granola and I was going to do that again, but when my kids got snotty and sick it felt like homemade gifts from my kitchen stirred by their germy little hands might not be the most appropriate displays of our affection. 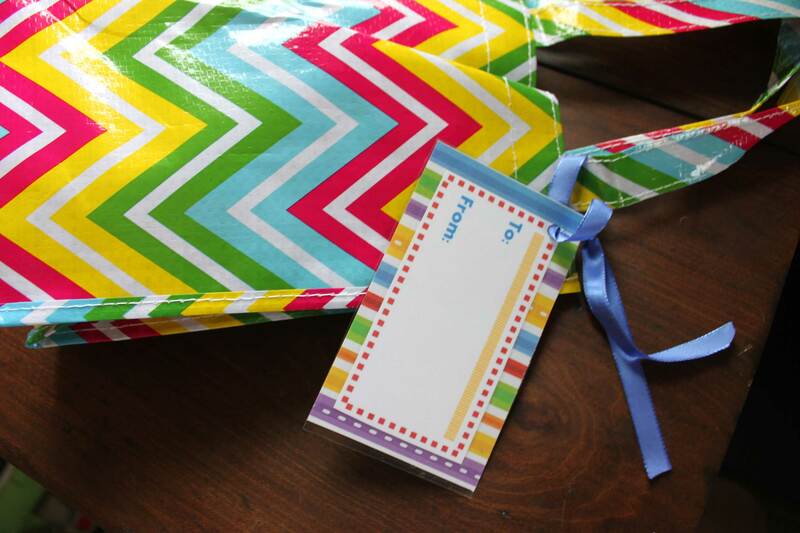 Instead I cut strips of cardstock and cut the recipients’ names out with paper punches, then let the kids paint their own designs on the strips. Each kid needed to make about five. After they were dry we wrote the children’s names on the back and laminated them to make sturdy personalized bookmarks. Hope you have a very merry, crafty Christmas! Gobble gobble! 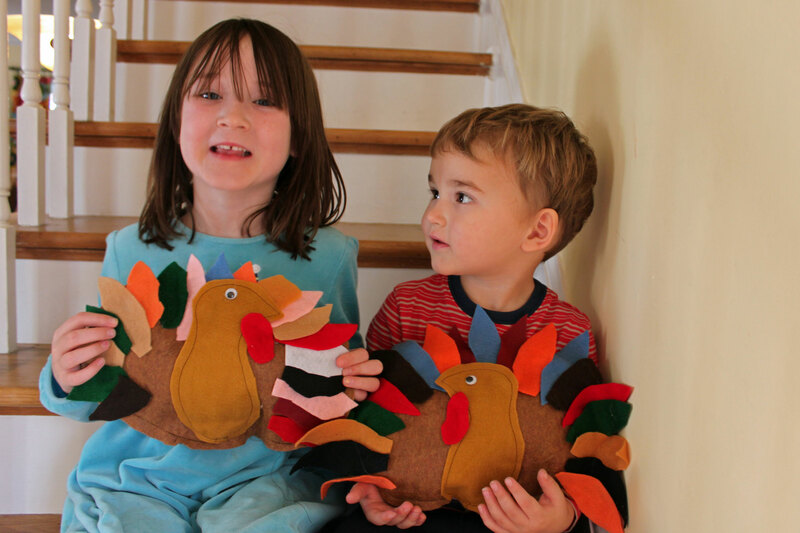 Dorothy and I made felt turkeys today as a homeschool art project. I cut ovals from brown felt and sewed them together, Dorothy stuffed them, and we did the rest with glue and scissors. My my little turkeys have their own turkeys, and they seem thankful indeed. Happy Thanksgiving! We’ve been on the move again. My awesome parents flew the whole family with them to Florida for some fun times at the beach. The last time we’d all been to the beach together was to celebrate my Mom’s retirement in 2010. 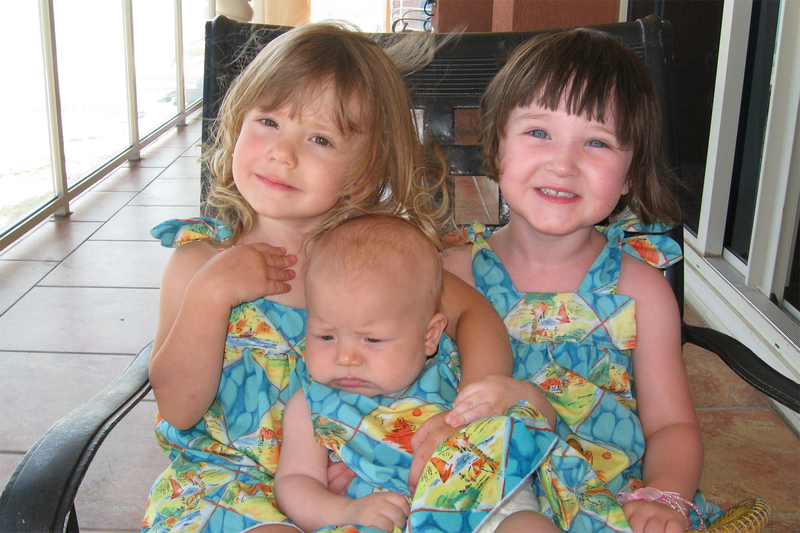 I made Dorothy and her cousins matching dresses to wear on that trip, pictured below. 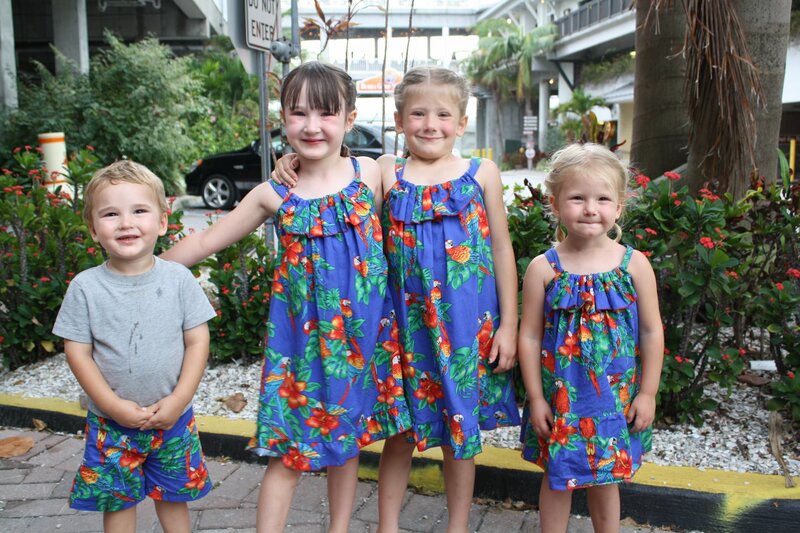 They were so cute running around in their little coordinating beach gear that I knew I had to do the same thing for this trip, plus some shorts for Worth. 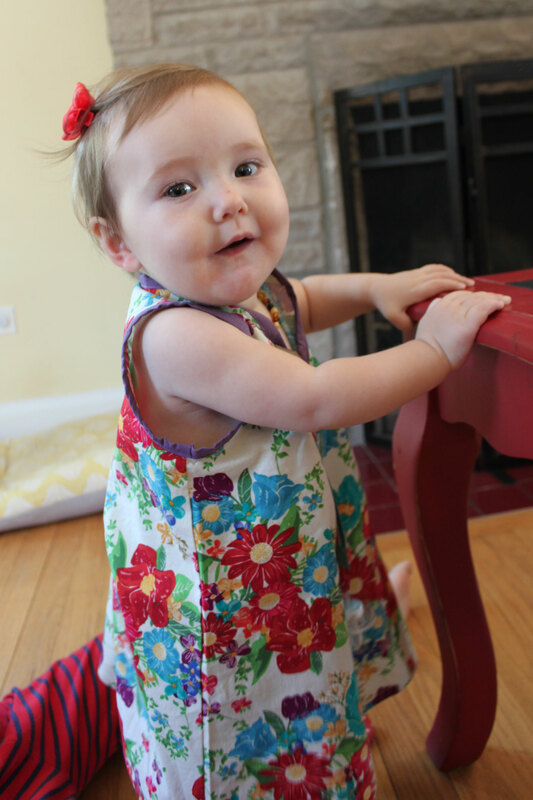 I bought this fabric and used McCalls MP339 as a basis for the dresses and just improvised Worth’s little shorts. 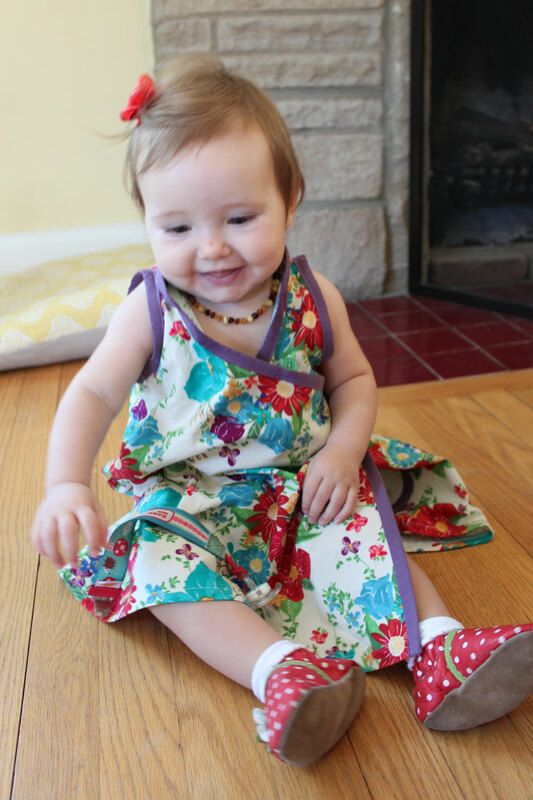 The pattern was simple and adorable and the sizing was right on except for the straps, which had to be shortened considerably from what the pattern called for. I added the ruffles to the top and bottom. The kids collected smiles and coos everywhere we went, and they liked their matching outfits so much they wore them for two days straight. This was the 2010 picture, with sweet little Maggie just 3 months old and Worth only a dear hope! I’ve been going through some photographs from the last couple months and I found these two that I’d taken this spring but not yet blogged about. This one above is a picture of our “toothpick lunch.” Dorothy and Worth are not the pickiest eaters I’ve encountered, but they aren’t exactly omnivorous when it comes to food either. 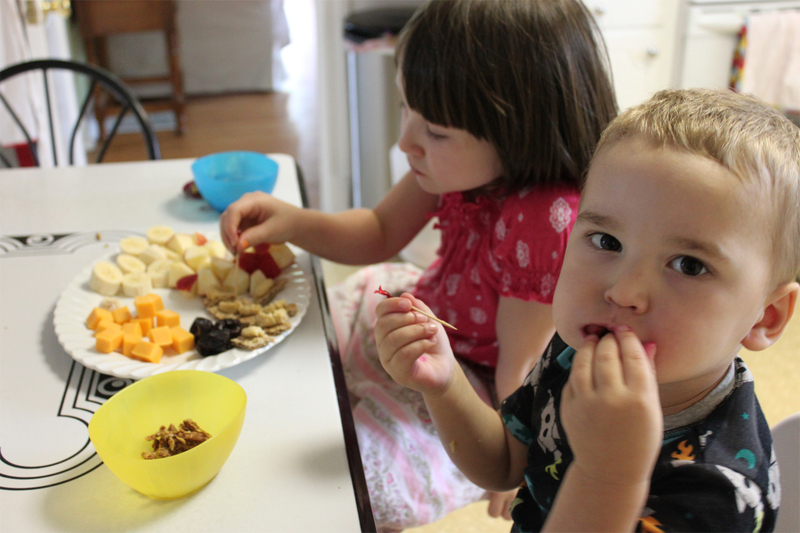 One of the strategies I find very useful for feeding them at lunchtime when I know we may not have their favorite foods on hand is to declare that we will have a “surprise lunch,” and that they must play away from the kitchen while I fix it. For some reason the pleasure of having the table set with food laid out on their plates (like a restaurant!) is so compelling to them that they may eat food they would otherwise not have selected. One day I really couldn’t come up with much that looked like lunch in a just-bef0re-grocery-time refrigerator and pantry. I had some cheese sticks the kids rejected because they weren’t the right color (the horror of yellow cheese when one prefers white! ), some crackers they didn’t like, some fruit. For some reason the line from the original Fancy Nancy book, about sandwiches tasting better with frilly toothpicks popped into my head. I sliced some fruit, cut up the despised crackers and smeared them with a little hummus, cubed the rejected cheese sticks, located a few other bite-sized goodies and arranged them on a breakable platter I wouldn’t ordinarily use for the kids, then I got down our cocktail toothpicks and set out an assortment of colors. The kids totally bought the “toothpick lunch” idea. They loved the colored toothpick frills, they giggled, and they ate every single thing on the platter. The color of the cheese or the substance of the cracker was never even mentioned. I’m absolutely going to use this idea again. Finally, Dorothy has been into puppet shows lately. 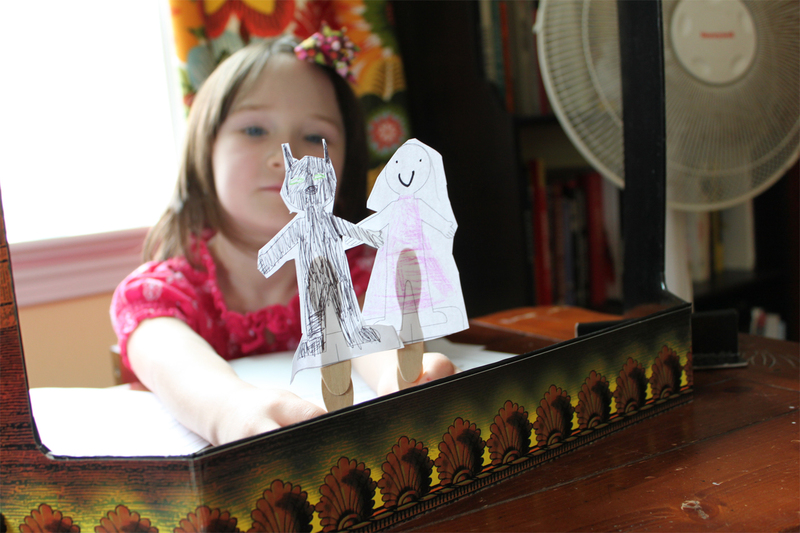 We have a small store-bought puppet theater but the game would be just as fun with a cut-out cardboard box. I’ve printed some scripts for her from a website I use as a resource to our homeschooling. She’s had a blast coloring simple paper doll forms into the characters for each script, gluing them to popsicle sticks, and then putting on performances. She can spend a long time doing this on her own, and I’ve also divvied up characters with her and participated in her performances. I love that she always dresses her narrator characters in black–how did she know? In this photo she’s holding Red Riding Hood and the Wolf. We gave the gift of spring t-shirts to our mothers for Mother’s Day a couple weeks ago. 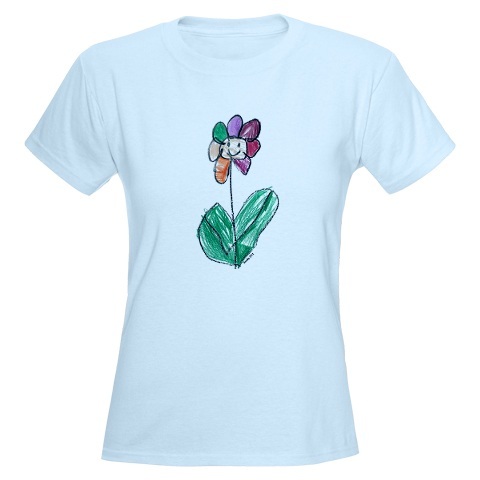 Dorothy drew and colored a charming flower, I scanned it and used Photoshop to remove the background, then I uploaded the image to Cafe Press and ordered the shirts. It would have been so much faster and cheaper to use printer transfer paper, but the shirts from Cafe Press make much nicer gifts. Unlike the transfer paper shirts they have no special washing instructions, they hold up over time very well, and you never accidentally sandwich pet hair between the shirt and the transfer when you’re ironing it on (past experience speaks). Both grandmothers have been wearing their shirts proudly. 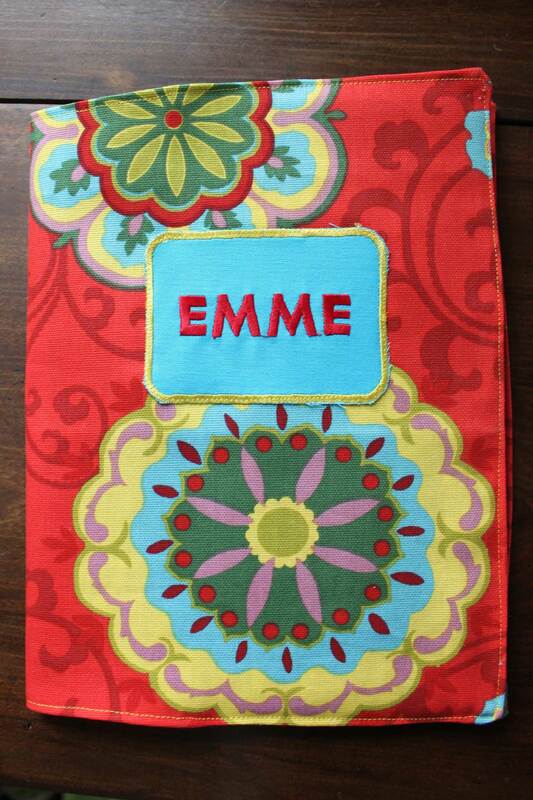 I’ve also been at my sewing machine a lot lately. 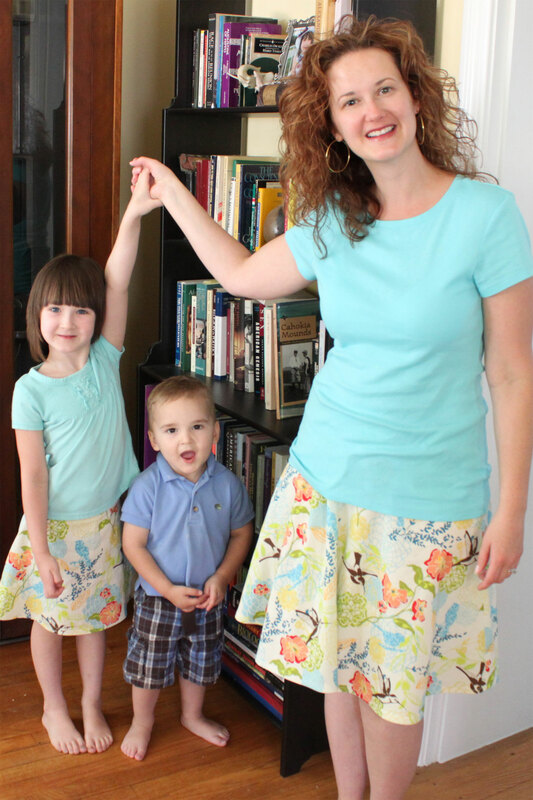 I’ve made three more versions of my favorite skirt pattern, including the one pictured. Dorothy loved the print of this skirt so much that I let her talk me into making a matching one for her. I didn’t use a pattern for hers but I wish I’d kept a paper version of what I cut out for it because it turned out so well. We’ve enjoyed running around town together being matchy. I know her enthusiasm for this won’t last forever, so I really do savor the strangers’ smiles and her enjoyment of our matching outfits.